Hello from Niagara region, Ontario! I've been researching here and there, and I've decided to get things started. So I figured I would introduce myself. Me and my better half have been wanting to start for about a year now, but had nowhere to do it. Then we bought a house. I intend to start with a small 2-3 barrel system in the basement to test things out. This will eventually become a breeding system with a larger system out on the deck in a yet-to-be constructed greenhouse. I have easy access to blue barrels at decent prices, and had intended on doing everything with them. So I got myself a 1000Lph pump. Then I found an IBC for dirt cheap, and I'm concerned it might not be enough. I'm all-ears for any tips/suggestions. Especially in regards to building a GH on the deck. Below is what I hope to achieve. Make sure your can handle the weight. To echo Cecil's advice, make sure your deck is sufficiently supported to handle the weight of all that water, grow media, and equipment. Water weighs about 8.34 lbs per gallon. Assuming your IBC is a typical 275 gallon one, it will weigh roughly 2200 pounds when filled to within a few inches of the top. Your grow beds will probably add another 800-1200 pounds, depending on flood levels and type of media used. Then, add all the additional supports (your sketch shows concrete blocks, which have some considerable weight to them), equipment, etc. My guess is that your system would weigh 3,400-3,800 pounds, not counting the additional weight of the greenhouse glazing, which could range a great deal depending on materials used. I'm always jealous of people who demonstrate their skills with sketchup. I wish I had the patience to sit down and learn it better. Your sketch is very well done. Again, welcome aboard. Great to have you with us. I will be adding extra supports before starting with the system. I can't take all the credit for the sketchup, They have a large amount of models others have shared. which includes a number of aquaponics systems. I just did the deck area, and added some ready-made models. As such, I will be using wood supports for all GB's instead of concrete. Thanks again, I look forward to the learning experience. 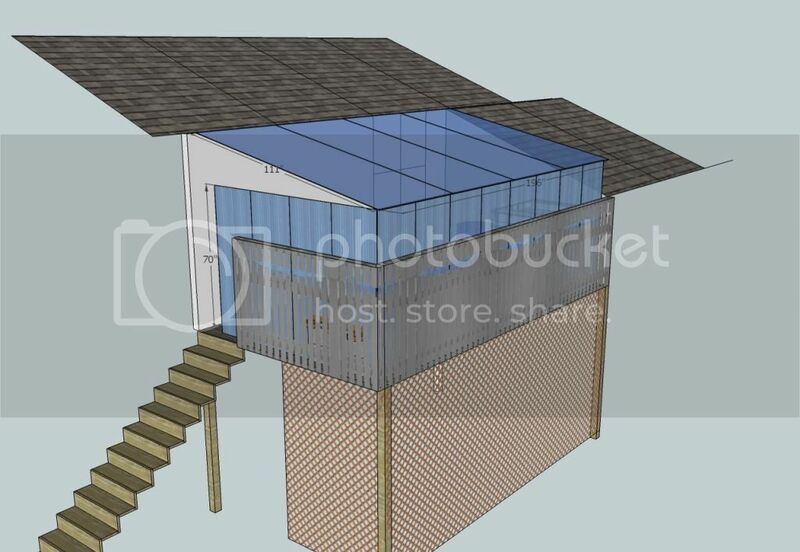 I would put the fishtanks under the deck upagainst the house wall, it would provide a more stable (lower) yearround temp. for the fish, maybe partly use glasing to collect light/heat below the deck in winter, as well ? Also the glas roof might let in to much sun in summer and potentialy strugle to carrie a wet snowload in winter ? If you're going to go to all of the trouble to make the greenhouse work in your situation, my advice would be to ensure that your aquaponics design includes appropriate mechanical and biological filtration. 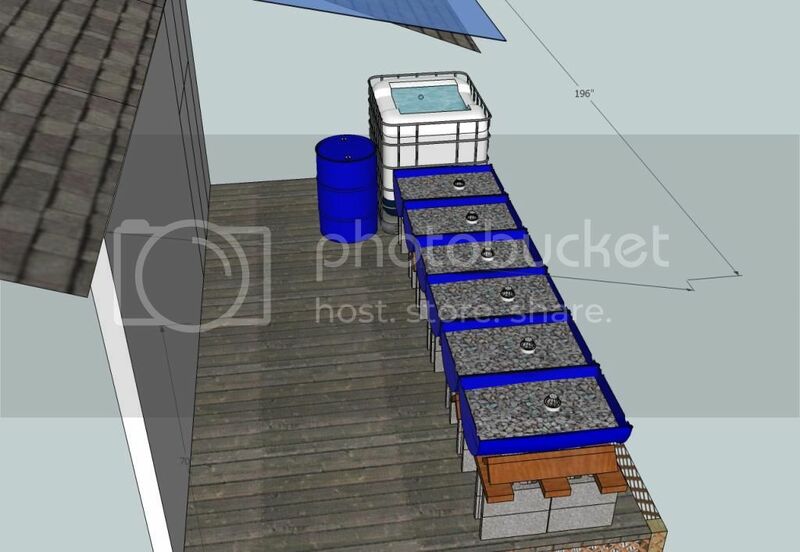 Ideally, you want a small recirculating aquaculture system to which you add your growing systems. At the moment, I don't think under the deck would work for the FT. And I won't be using glass for the GH. I was thinking either poly carb sheets, or poly film. Trying to keep the weight down. I do intend to use a swirl filter and sump tank. I'm not sure where to find bio filter media in my area though. Biomedia can be bought from lots of places and, because it is so light, it can be transported at modest cost. I'm certain that someone in Canada would be selling biomedia like Kaldnes K1 or MB3. You can also use trickling bio-filtersâ€¦â€¦for which our favourite media was oyster shells. Hmm, I'll have to look into the Kaldnes k1. I imagine a barrel of oyster shells would be fairly heavy. You can also use scrubbies if you can find them inexpensively. This factsheet covers the design, construction and use of the attached solar greenhouse in the home. It provides diagrams, tips, statistics and practical standards to be incorporated into any project. Whether itâ€™s the construction of a new greenhouse or the renovation of an existing one, this guide provides accessible, scholarly information for all interested homeowners. Thanks Ande! I'll give that a read. Thanks Ande - always providing a wealth of valuable links/resources! I'm giving that a pdf a read myself. Nice drawing. I'm in your area between lake and escarpment. Weather here is great for greenhouse!! Good luck!